The German Patriot air and missile defense systems, stationed at the Turkish border with Syria, have carried out “unexplained” commands allegedly issued by unknown hackers, according to a German media report since rebutted by the government. The US-produced missile systems, belonging to the German Bundeswehr armed forces and based on the territory of NATO ally Turkey since 2013, have been compromised, according to a report in the German Behörden Spiegel. As a result, the systems, consisting of six launchers and two radars, reportedly carried out “unexplained” orders, the publication claimed, providing no further information on the kind of commands. A spokesman for the Federal Department of Defense however rebutted the report on Tuesday, saying that “there is no base data” for an extremely improbable attack, Die Welt newspaper reported. According to the magazine, there could be two weak spots in the system, which was first used by the US army over 30 years ago. The first one is the Sensor-Shooter-Interoperability (SSI), which stands for the information exchange between the missile launcher and its control system. Another weakness could be in computer chips, which are responsible for the guidance of the weapon. Compromising military systems is not something that an amateur hacking group would have the skills to do, or would want to admit doing, believes computer security consultant and former UK-based computer hacker Robert Jonathan Schifreen. He told RT that the “unexplained” commands from the hackers mentioned in the report, while “certainly worrying,” could not possibly be anything of much significance. “It is certainly the case that foreign governments, intelligence agencies do try to hack into these systems, and it may well be that the software built into the missile has been compromised in some way by some foreign government,” he added. But the main risk, says security expert Billy Rios, stems from software upgrades that provide smart weapon capabilities to the weaponry, along with incompetence of local operators who have only basic understanding of how these military systems work and connect to each other. “And it’s probably a question they are not very comfortable asking themselves,” he added. “The US based software is often very closed, very proprietary, nobody is allowed to see what their codes contain and the NSA has lent on companies to make sure that back doors are built in, which is for NSA to look at and its vassal states,” Machon told RT, talking on the vulnerabilities of the military hardware, governed by American software. 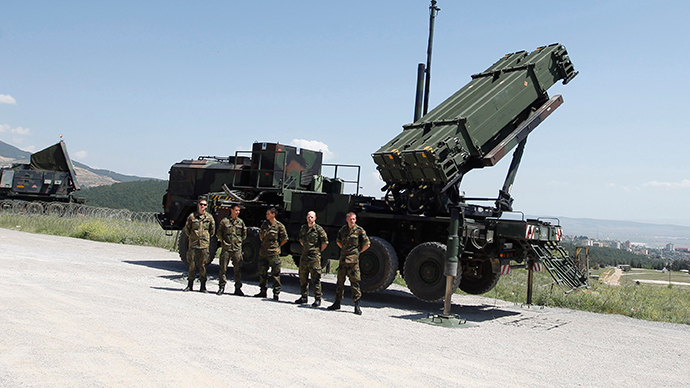 Last month, Germany announced that it planned to replace Patriot missiles with MEADS (Medium Extended Air Defense System), a new air defense system developed by the USA, Italy and Germany. The cost of the move is estimated at more than €4 billion. “Who actually has their finger on the trigger? This is a basic problem for partners of the US. If they buy US software, if they buy US military hardware, do they really have control of it?” Machon wondered.